Thank you for registering to join us for Free Calls with Geneen. We will send you an email notification when the next call is scheduled. In the meantime, enjoy "The Doorway to Everything." I just started doing this and found myself just scarfing and scarfing. It was shocking to me how I was eating and I didn’t realize it until I stopped eating and reading. Thank you for this call. This was lovely. it’s the first time I’ve listened to one of these with Geneen. I wish I culd attend her retreat but it’s kind of out of the way for me. I had attended one in New York many years ago. I look forward to another being held in New York sometime soon then I would certainly attend. Thanks again for all of this wonderful! I really want to apply these steps in my life! Dear Geneen, I have listen to several of your free-calls now, but today, I felt that the 7 steps were deeper in me, I could really be with you, and with the rest of the people listening to you, and that felt really great! I am grateful for this possibility to re think my whole relationship with food and with myself. The 2nd and 3rd steps talked deeply to me, but today, somehow, the 6th step, really got my attention and my saddest memories about me being seeing for my family while eating and how painful all that was…I could really touch the rawness of my pain and suffering with food, and now, I do really understand where I come from. Walking with you all, blessings! 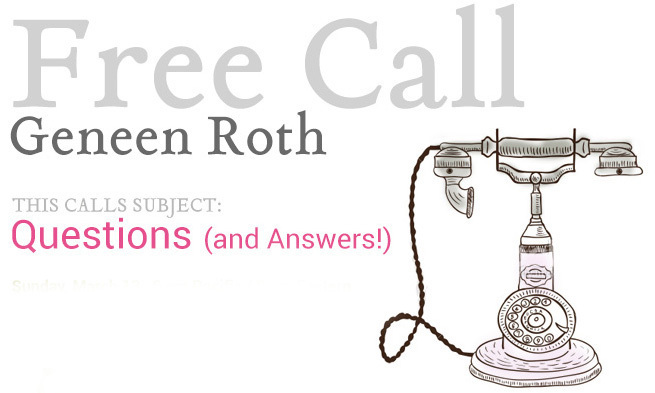 The phone call on the Seven Steps to Freedom from Food was both informative and inspiring. When I hear Geneen speak, I always feel that I have the power to heal my relationship with food. What I have a problem with is what I felt was a disruptive moment at the end of a call that was full of wisdom and insight. Geneen’s discussion of how the supportive environment of a retreat would support a person who has just begun their commitment to the Seven Steps felt like a contradiction of the encouragement Geneen had given throughout the call. During the call, I felt like Geneen was telling me that I had the strength I needed to change my life. When she brought up the retreat, I felt like she was implying that attending a retreat was the best way to start one’s commitment to the seven steps. I am poor and physically disabled. 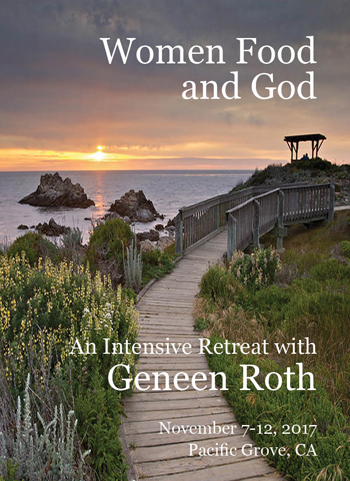 I can’t afford to attend Geneen’s retreats. What about those of us who want to have a healthy relationship with food but can’t afford the retreats, workshops and online courses geneenroth.com offers?